You can find us on Postmates and Grubhub. If you are within their approved delivery zone, they will pick up and deliver to you. We will adjust our hours based on seasons & the needs of our customers. Why aren't you open earlier? We are primarily a soft serve/smoothie store, but if there is enough interest in us being open earlier, we will definitely consider it. Why do you call your product soft serve and not frozen yogurt? Since our product is dairy-free, technically, we can't call it yogurt as that implies dairy. What is your soft serve made from? Our dairy-free soft serve is a handcrafted almond cashew base, with almond milk made from whole almonds, organic ingredients, and then flavored. We add probiotics for digestive and immune health, so that our customers get similar benefits to what they would get in dairy yogurt. The almond milk is made fresh, which contributes to the creamy taste of our soft serve. For a full list of ingredients, see ingredients tab under menu. Why didn't you have my favorite flavor today when I came in? We can only have 6 flavors at a time, so we need to rotate flavors from time to time. We will always have a few main flavors like strawberry and chocolate, but some of the other flavors will rotate. If we don't have your favorite in the machine, we might have it frozen and if so, we are happy to give you scoops or sell you pints! Do you have any soft serve flavors that don't contain nuts of any kind? Not at this time. Our Ganesha's Sweet Greens and Purple Power flavors are NOT made with almonds, but they DO have cashews. We hope to make a coconut base in the future. Do you have any sugar-free soft serve? 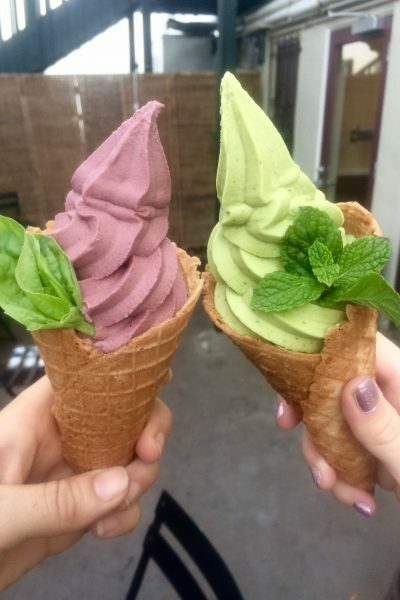 Our Ganesha's Sweet Greens and Purple Power soft serve flavors have no added sugar and we hope to do a few more of these in the coming years. Are all of your menu items organic? 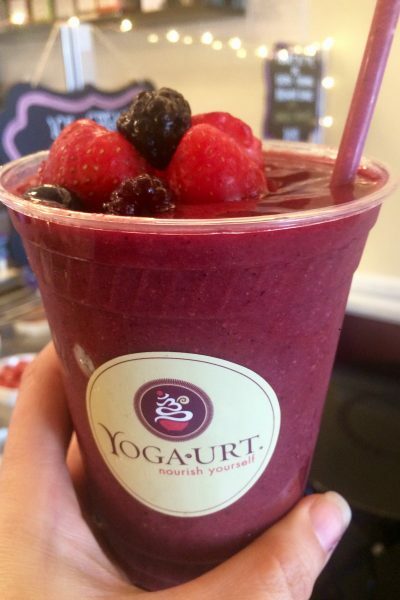 All of our soft serve, smoothies, kombucha, coffee, and tea are organic. 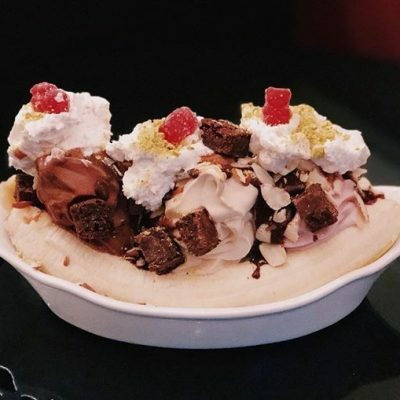 Most of our toppings are organic with a few exceptions noted in the store. 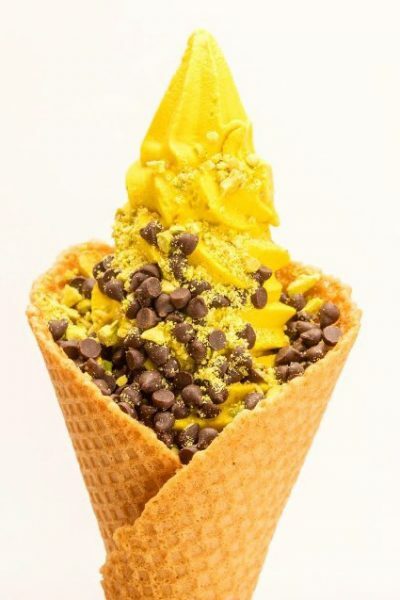 Our waffle cones use all organic ingredients except for the gluten-free flour. ***There are times when an ingredient is not available and in those rare cases, we will substitute with the next best option. Are all of your menu items dairy-free? 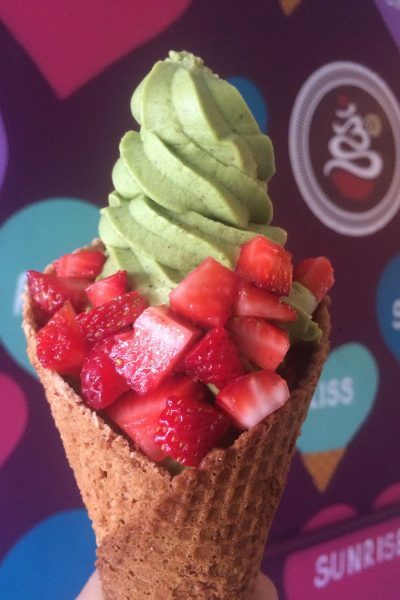 Yes, our soft serve, smoothies, toppings, waffle cones, coffee, and tea are all dairy-free. Are all of your menu items gluten-free? All of our soft serve, smoothies, coffee, and tea are all gluten-free. We also offer a gluten-free waffle cones. With one exception, all of our toppings and sauces are gluten-free as well. The one exception is our mochi topping which is labeled in the store. Do you have GMO's in your product? We're very proud of the fact that all of our delicious menu items are non-GMO. Why does your soft serve cost more than some similar products? We use the highest quality, most premium ingredients on the market so that our customers get quality products that align with our values as a company. We use organic natural ingredients with no artificial flavors, sweeteners or preservatives. Why are you adding probiotics to your soft serve? What culture strains are you using? We want our customers to get all of the benefits that dairy soft serve has plus more, so we made sure that our product had probiotics. Probiotics help maintain digestive health and support the immune system. Yoga-urt soft serve contains a special blend of 4 live and active beneficial bacteria strains including: L. Casei, L. Rhamnosus, L. acidophilus, & B. Bifidum. Do you heat your product? Is it pasteurized? When we make our almond/cashew base, we heat the mix to pasteurize it and bring out the best flavor of the almonds and cashews, along with insuring our product is safe for you to eat according to health department code. After the mix is cooled, we add probiotics so that they are live and active. Are your paper goods eco-friendly? All of our bowls, cups, napkins, and straws are biodegradable and we strive to use recyclable packaging whenever possible. Even the stickers on our smoothie cups are compostable. Yes, we are currently selling pints at the store. Best to call ahead for large orders or to guarantee that we have your favorite flavor. Can I reserve the back patio? 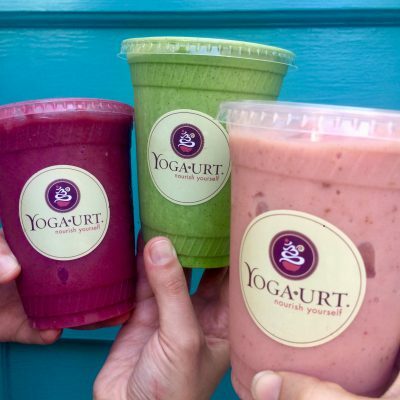 Yes, please ask for Melissa if you are interested in reserving the back patio or contact us at info@yoga-urt.com. Yes, we sell gift cards in the store. Do you have loyalty cards? Yes, ask the cashier for your loyalty card. We are working on our catering service. If you have an event, let us know and we'll see if we can work something out. Our Glendale shop is the first of what will hopefully be many locations in the future! 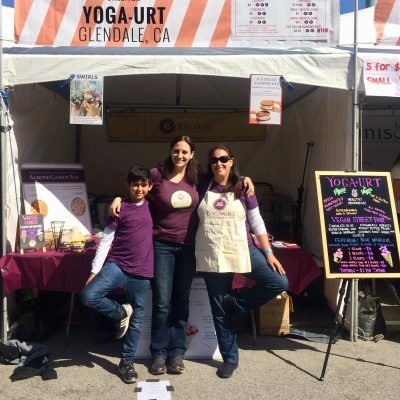 I love Yoga-urt and want to be a part of it. How can I get involved? 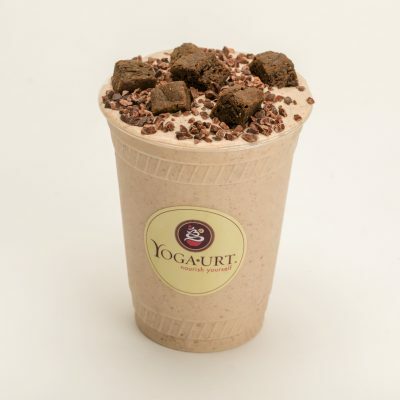 If you are interested, email info@yoga-urt.com and let us know a little about you.